There is nothing that I love more than gardening in the summer. I try to plant a larger garden every year and while I do love canning some of my produce to preserve it, I also love serving fresh fruits and veggies from my garden all summer long. This means of course, that I need a good produce storage solution to keep that produce fresh for as long as possible. Until now, I had merely been storing it on the kitchen counter whenever I brought it in from the garden. Recently though, I have been looking at better ways to store my produce, and this includes things that I buy from the grocery store too, like bananas and oranges. I started looking and found 20 creative DIY produce storage solutions that will help to organize that produce and keep it fresh. These range from DIY hanging baskets to actual produce bins that look just like the ones in department stores – only they are a lot cheaper to DIY. I love gardening DIY’s, like these DIY insecticides that keep gardens naturally pest free. 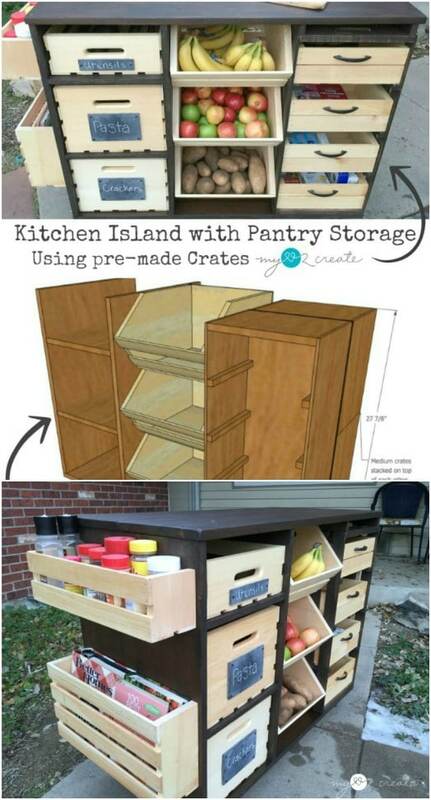 And, I can’t wait to get started on my DIY produce storage bin. Whether you plant a lot of fruits and vegetables or you just want something to keep your store bought produce fresh, these DIY produce storage solutions are perfect. All of them are really easy to make and many of them can be done with recycled or reused materials. If you love gardening as much as I do, you are going to adore these ideas for keeping your produce fresh, and many of these would make wonderful gifts. If you know someone who loves gardening, be sure to check out my 20 unique DIY gifts for gardeners, too. You can buy a hanging fruit basket, but where is the fun in that? You can make this DIY version a lot cheaper and this is a really simple project. 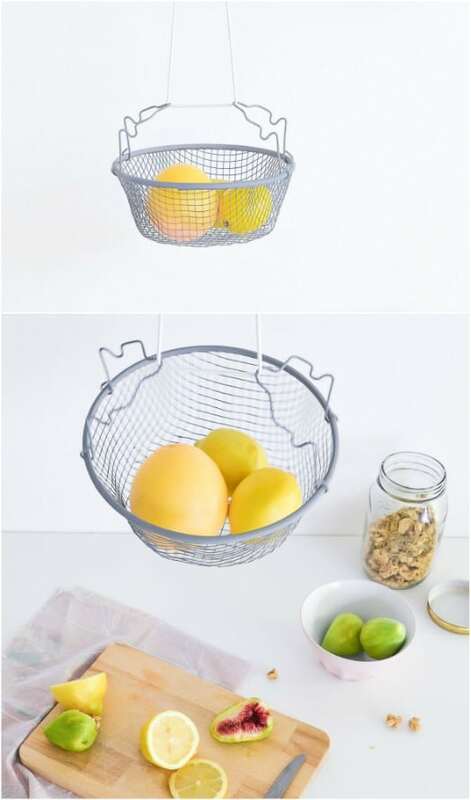 You just need a wire basket and some rope – and you could totally turn this into a tiered hanging basket so that you have a space for your apples, bananas and oranges all at the same time. You could even use this for onions or small amounts of potatoes. If you plant enough potatoes to last you all year long, you definitely need a dedicated space to store those potatoes. 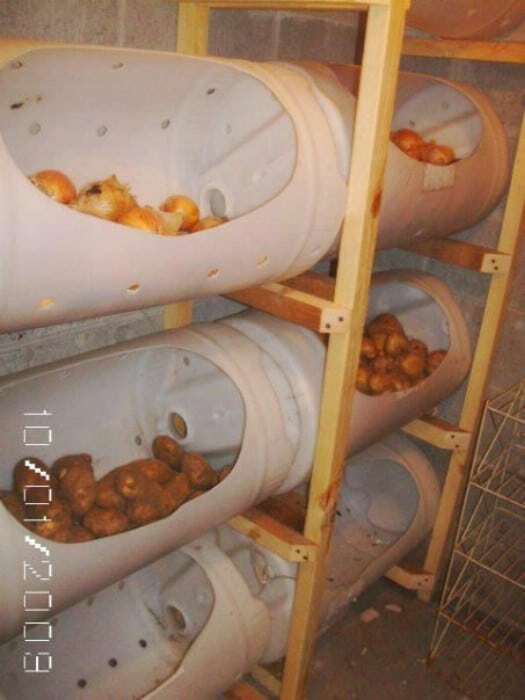 These DIY potato bins couldn’t be easier to make and you can create a stacked system so that you have room for all of those potatoes that you plan to grow. These are made from plastic barrels or buckets and a few boards to create the stand. This will come in handy whether you plant a garden full of potatoes or you grow them in potato towers, bins and containers. 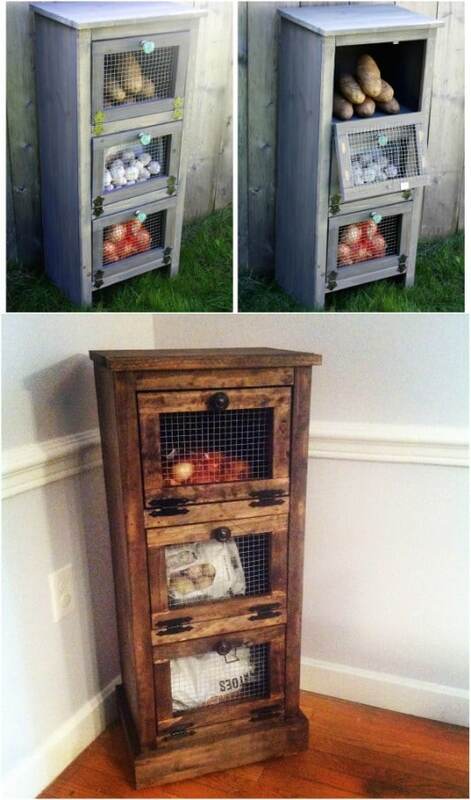 I love a good rustic farmhouse DIY project and this pallet and chicken wire produce bin certainly qualifies. You can buy one of these but you’ll be spending a pretty penny. Instead, just make this one yourself. 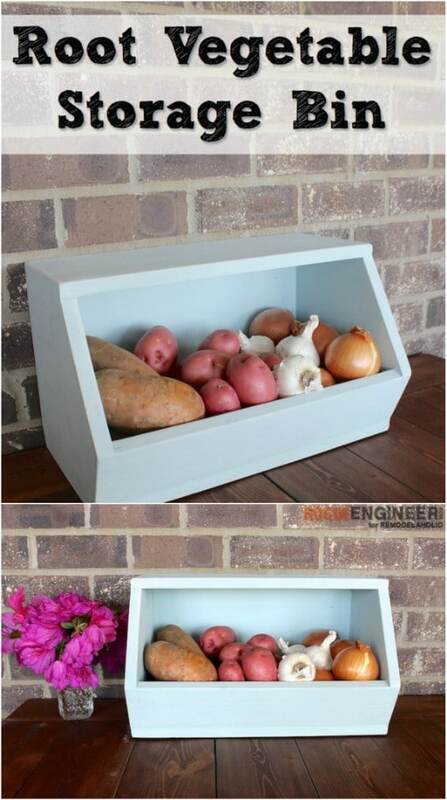 It has three separate bins so you can store potatoes, onions, sweet potatoes or garlic in it and it is really simple to make. This is a great project for your DIY farmhouse kitchen décor. 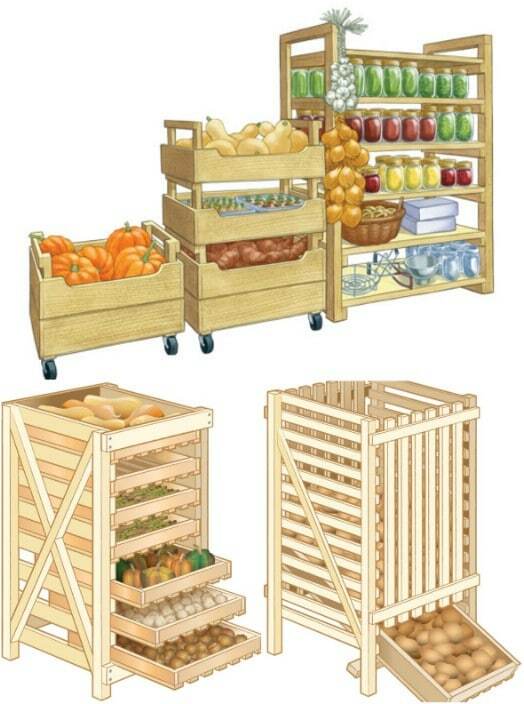 You can build your own DIY wood crates and then stack those crates to hold all of your produce. Have separate stacks for fruits and veggies. These are so simple to build and making your own is much cheaper than buying them in the stores. You can also put wheels on all of them or the bottom ones to make moving them around much easier. 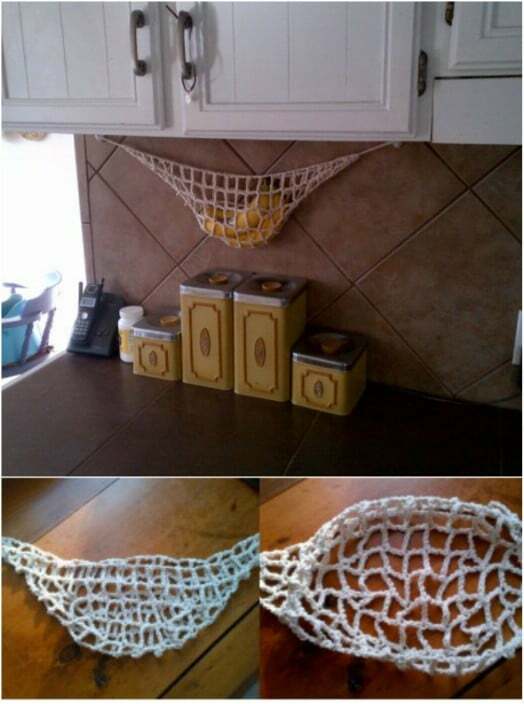 Keeping bananas fresh and organized can be as simple as crocheting your own banana hammock. This is honestly one of the easiest crochet projects you will ever undertake and it makes an adorable hammock that lets you store those bananas up off of the counter. You just hang the hammock under a cabinet. 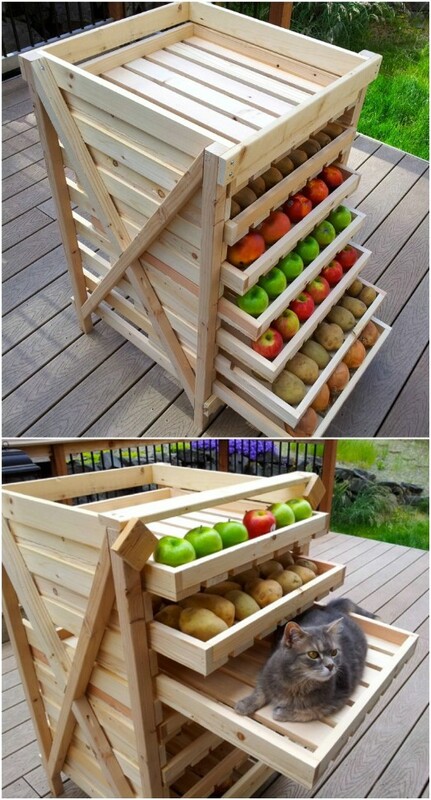 You could also do one of these for apples, oranges or other fruits and have all of your fruits organized. You can keep all of your produce put away where it will stay fresh with these DIY hanging produce baskets. Not only does this system keep your fruits and veggies organized, it keeps them right there where you can grab them as you need them. 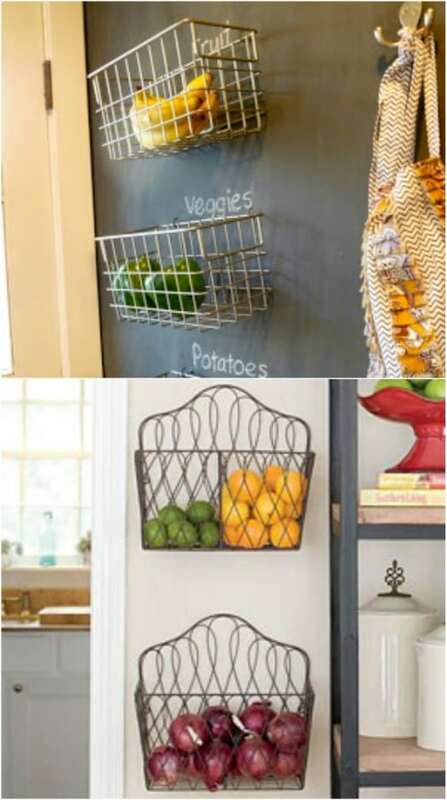 You just need a few wire baskets and a dedicated wall space to create this DIY produce storage solution. A few plastic crates and an old dresser or shelving system are all you need to create your own DIY produce storage system. 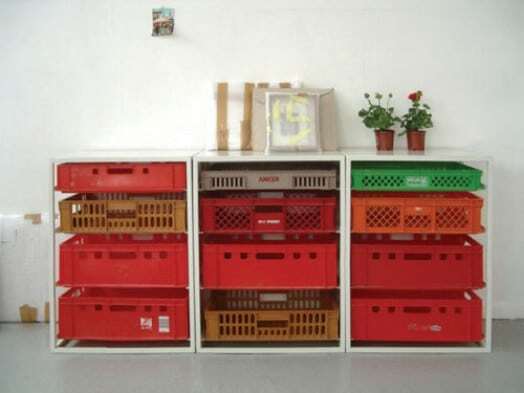 You can use plastic milk crates or those shorter plastic crates that bottled drinks come in. Check with your local grocery stores or even thrift stores to find crates really cheap. 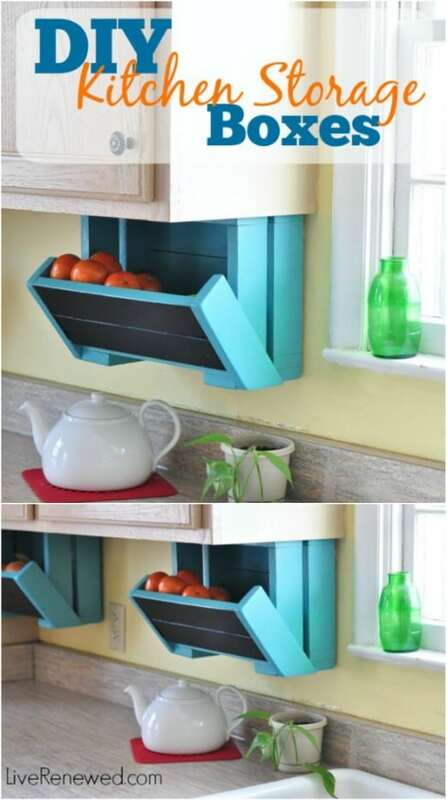 Then you just have to add them to an old dresser or other shelving unit and you have storage for all of your produce. You can store your produce on any shelf or rack, and you can organize it with these adorable DIY paper bag baskets. You make these from upcycled paper grocery bags – or you can buy paper bags at any hobby store or Walmart. The weave makes them really strong and you could even paint the outsides and label them if you wanted. The possibilities with this one are endless. 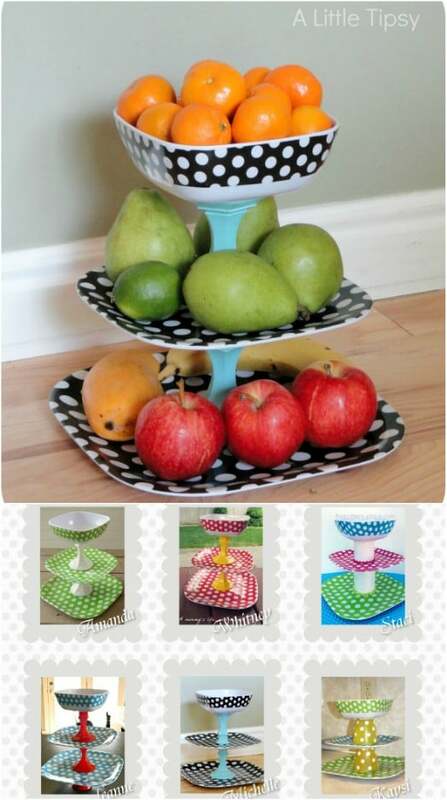 Here is a great little fruit stand that you can display right there on the counter or on your dining room table. You can use any plates that you want – although these polka dots are really adorable. You can find matching – or unmatching if you want something eclectic – plates at your local thrift store. Then you just need a few basic craft supplies and a couple of sturdy candlesticks. You could even do this with DIY decorative plates to get a unique look. simple to build and have such a great rustic look to them. 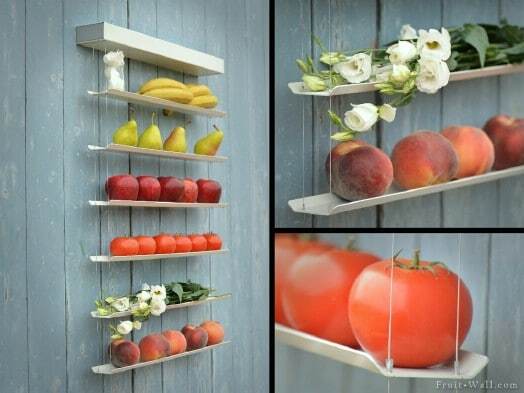 How creative are these produce storage shelves? You make them from old mini blinds – which by the way are pretty cheap if you check your local thrift stores. 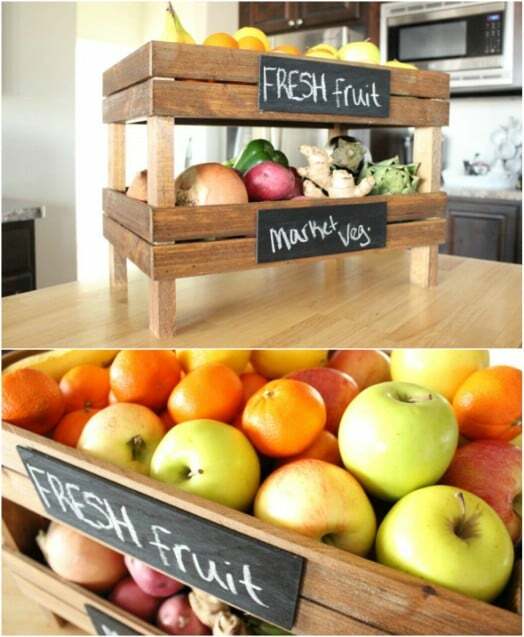 These are really simple and are an adorable way to store and organize that fresh produce. I wouldn’t recommend them for storing masses of potatoes or onions, but they are perfect if you just have a few pieces of produce to put away. This little produce stand won’t cost you much at all to build. It’s only around $30 if you have to buy all of the materials. If you have some boards leftover from other projects or even an old pallet, it won’t cost you much at all to build. It’s slim so it is perfect for sitting at the end of your cabinet or you could put it in the pantry or wherever you have a bit of extra space. With three bins, it will hold all of the produce that you need to store. 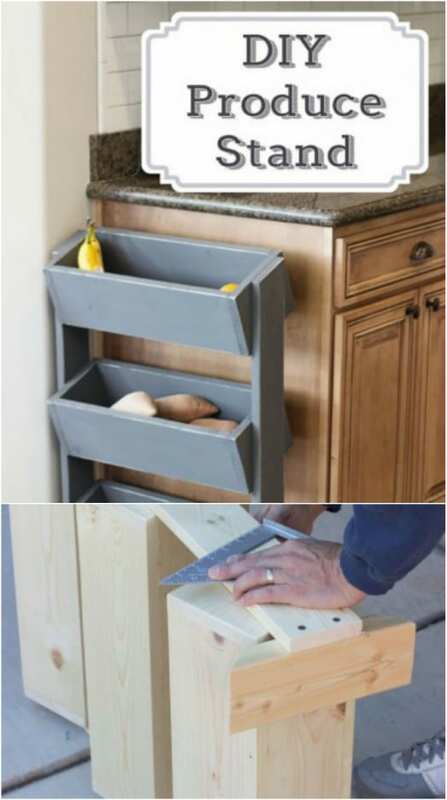 If you are redoing your kitchen cabinets, or you happen to have one that you just don’t really need, you can create this DIY slide out basket storage for produce. 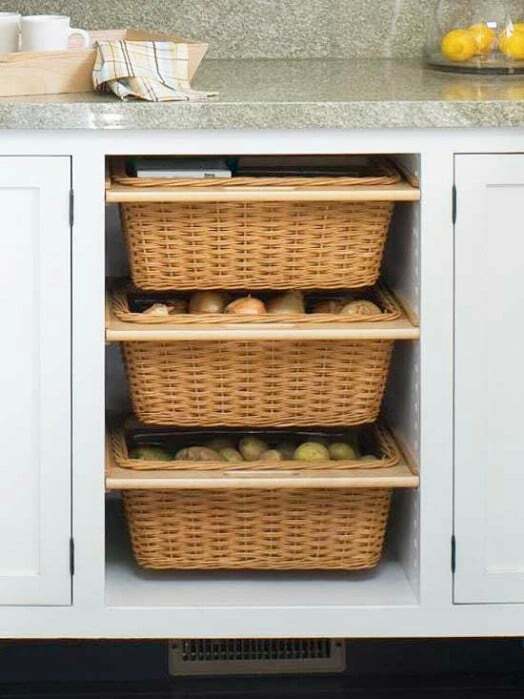 You just take the door off of the cabinet and remove any shelves that it may have and then add your DIY sliding solution to hold your produce baskets. This saves space and it looks wonderful when you add the baskets. These little wooden produce bins are so easy to DIY. They have openings in the front that make it really easy to get produce in and out and they fit perfectly in your pantry shelves or on a countertop. You could also mount these to a wall in the pantry and have several of them hanging together to fit all of your produce. 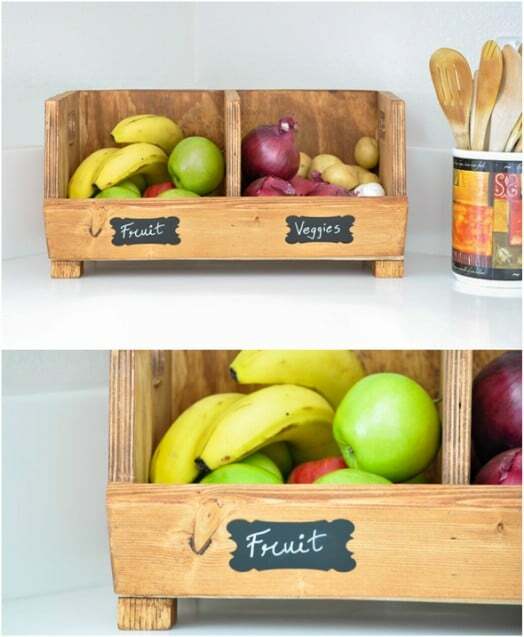 If you need to store a couple different types of produce and you want something really easy to DIY this rustic looking wooden storage container is perfect. I love the little chalkboard sections on the front where you can label your produce. This is the perfect addition to your farmhouse kitchen or you could stick it on a shelf in the pantry. These little stackable produce bins are really thin so they don’t take up much space. You add a little chalkboard sign to the front of each so that you can label them. These are so simple to make and if you have a bit of leftover wood on hand, they won’t cost you anything. 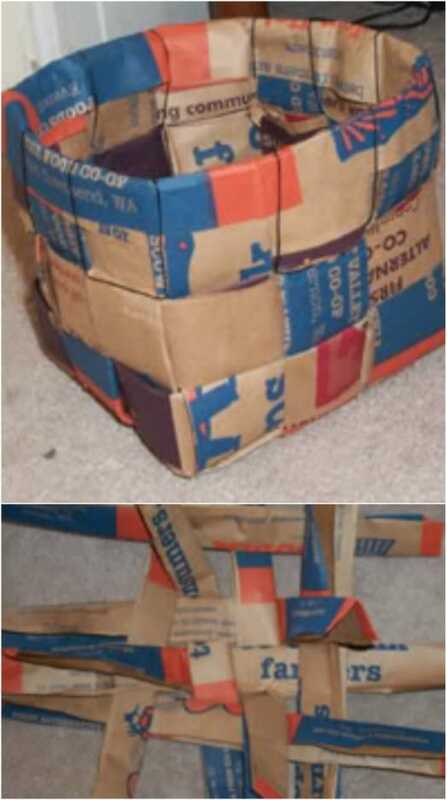 You can build them for under $30 even if you have to purchase all of the materials to make them. And you have to love good DIY chalkboard paint projects! This wooden produce storage may just be my favorite of all. It doesn’t take long to build this at all and the bins slide out so that you can easily add produce or take it out when you need it. There are six different bins – or you could make as many or as few as you need. This can fit on the shelf in the pantry or on a countertop if you have the extra space available. 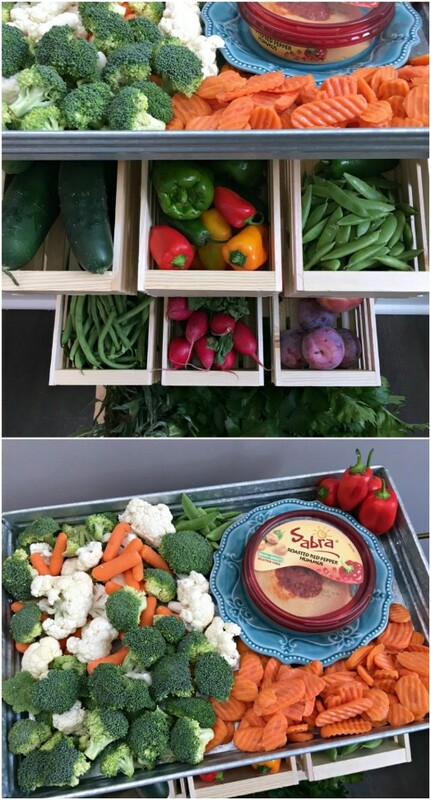 This DIY Produce stand is made with cheap wooden crates that you can buy at any hobby store and it has room for all of your produce. The top is a large wooden platter that you can use to serve up those veggies and fruits! This one is really simple to build and looks like an old fashioned fruit stand that you would find at farmer’s markets. Take an old shutter, paint it and then add some metal or wooden baskets to get a gorgeous rustic looking produce storage system. 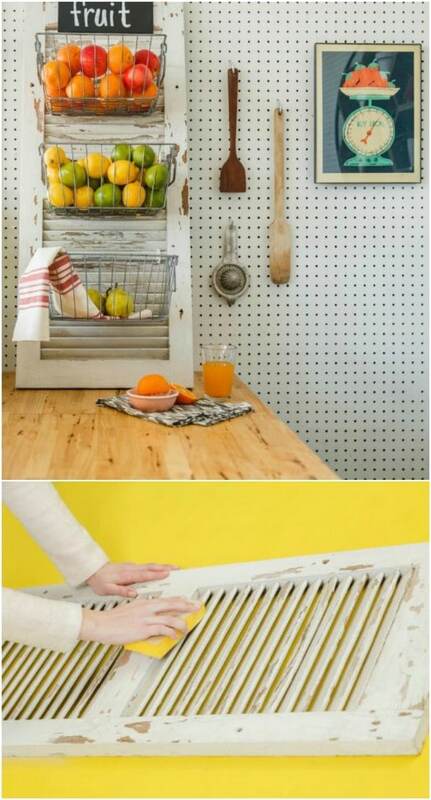 This one is super easy and it is a great way to upcycle some old shutters if you have any on hand. If you don’t have a shutter to use, check with your local contractor or thrift store. You can get them really cheap and then you just need to add the baskets. How cool is this DIY kitchen island? It has produce storage on all sides so there is plenty of room for you to keep that garden harvest fresh. Slide out wooden crates keep some of your produce and the rest is kept in wooden bins that you can easily reach into to grab out what you need. If you have ever wanted a DIY kitchen island, this is definitely a great one to make. It gives you the island that you want with all the produce storage that you need. This is a great DIY farmhouse furniture project.